Edinburgh based architect Richard Murphy returns to the city of his birth to transform one of Manchester�s oldest surviving industrial structures, Murray�s Mills in Ancoats, into ambitious residential and commercial properties. Richard has spearheaded numerous projects both in the UK and abroad including The British High Commission in Sri Lanka; University of East London and Caernarfon Arts Centre in Wales. Now, the award-winning architect is to work with urban regeneration specialists The Burrell Company and Inpartnership to breathe new life into the oldest surviving steam-powered cotton mill in the world. The ambitious plan is to include 130 residential apartments, expansive commercial space, live/work units and a 60-bed hotel. 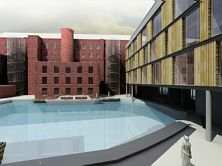 The development will be built around the restored canal basin and is part of a major regeneration project for the North of England. Richard, who left his home city at the age of 18 said: "I am particularly excited to be working on this development as Manchester is awash with warehouse loft conversions but this is something very different. We don't want to lose sight of the warehouse's distinct characteristics. "My earliest memory of Manchester was when I was five and all the buildings were black - like many industrial cities at the time. But modern-day Manchester is now a very exciting place, with lots of interesting architects working there and restoring its marvellous buildings. It's great to be part of the buzz." Andrew Burrell, Managing Director of The Burrell Company, said: "We have been involved in numerous restoration projects in Scotland but I am very excited to have Richard Murphy on board for our first project south of the border. "Richard has a wealth of experience in this area and is well-respected within the industry. He knows how to complement the old with the new and with this particular development, keeping many of its original features and magic is fundamental." Inpartnership Managing Director, Duncan Sutherland said: "Richard has been involved in some of the most high profile developments in the country. I'm confident he will help retain the original visual impact of the Mills whilst injecting renewed life to the site as well as benefiting the wider community as a whole." Richard Murphy studied at Newcastle and Edinburgh Universities before founding his practice in Edinburgh's Old Town in 1991 and employs 31 members of staff. His early reputation was built on highly crafted and innovative domestic work primarily in the Edinburgh area before going on to achieve major awards for a number of large-scale projects here in the UK and abroad. Awards achieved for excellence in architecture include: RIBA award for Maggie's Cancer Care Centre, Edinburgh; RIBA Crown Estate Commission Conservation Award for Stirling Tolbooth Arts Centre and a Scottish Design Award for the Computer Centre at Napier University, Edinburgh. As well as heading up his successful practice, Richard also finds time to be involved in a number of teaching posts at UK educational establishments and at universities in Germany, Virginia and New York. He is also a member of the RIBA, fellow of the RIAS, The Royal Society of Arts and Royal Society of Edinburgh amongst others. Richard also presented a Channel 4 documentary on the great architect Carlo Scarpa in 1996. In 2006 Richard was voted 'Scottish Architect of the Year' by Prospect Magazine and was also awarded an OBE in this year's New Year Honours list. Work is due to begin on Murray's Mills in autumn 2007 with properties being released for sale in 2008.